Professor Felix Salako is a Professor of Soil Physics in the Department of Soil Science and Land Management, College of Plant Science and Crop Production (COLPLANT) of the University, he attended the famous Apostolic Church Grammar School, Orishigun, where bagged his West African School Certificate Education under Division One, as well as the Igbobi College, Lagos; the University of Nigeria, Nsukka, where he obtained his B. Agric (Hons) and M.Sc degrees in Soil Science in 1983 and 1986, respectively before proceeding to the University of Ibadan, where he bagged his PhD Degree in Soil Science, in 1997. Professor Felix Kolawole Salako, was born on April 18, 1961 to the family of late Pa. J. A. Salako and Madam R. W. Salako. Professor Salako was born and bred in Ebute Metta (East), Lagos, though his father hailed from Ibadan and his mother (nee Koku) was from Abeokuta. He is the last child of the seven children of his parents. His father passed on when he was eleven years old but he left adequate resources which were prudently managed by his mother to train and support their children and dependants until her demise in 1995. Professor Felix Kolawole Salako attended Salvation Army Primary School and Saint Jude’s Primary School, Ebute Metta between 1968 and 1972. He proceeded to the Apostolic Church Grammar School, Orishigun village, Lagos in January 1973. He was the Labour Prefect during the 1976/77 academic session and graduated in 1977 with Division One of the West African School Certificate (WASC). He had a one-year stint of Higher School Certificate Education (Lower Sixth) at Igbobi College, Igbobi, Lagos before he was offered admission into the University of Nigeria, Nsukka in 1978 to study Agriculture (Soil Science Option). He was the best graduating student of his Department in 1983, with a B.Agric. (Soil Science), Second Class Upper Division. His research career started effectively during the 1982/83 academic session under the supervision of the Late Professor (then Dr.) Joe Sonne Chinyere Mbagwu of the Department of Soil Science, University of Nigeria, Nsukka. After his National Youth Service as a Graduate Assistant at the Ahmadu Bello University, Zaria, he returned to Nsukka in 1984 to pursue his M.Sc. Degree (Soil Physics/Soil Conservation) under the supervision of Dr. M. E. Obi. He obtained a grant as a Research Scholar to carry out aspects of the M.Sc. research at the International Institute of Tropical Agriculture (IITA), Ibadan under the co-supervision of Dr. Rattan Lal, a world-renowned Soil Physicist. He obtained his M.Sc. Degree (Soil Physics/Soil Conservation) in 1986. Professor Salako started working in 1987 as a Consulting Soil Scientist in a private Engineering and Geology firm called TCI Associates in Bodija, Ibadan. This work led him to survey over 30,000 hectares of land in Northern Nigeria for irrigation development. Later, he workef on coastal erosion control in Aiyetoro, a riverine community in Ondo State. He proceeded from Consultancy to the International Institute of Tropical Agriculture (IITA), Ibadan in 1989 to manage an IITA/United Nations University project titled “Effects of Deforestation and Land use on Soil, Hydrology and Microclimate and Productivity in the Humid Tropics”. The project was located in Okomu Oil-Palm Company, in Okomu Forest Reserve, Udo, Ovia South West Local Government, Edo-State where he was a Resident Research Associate between 1989 and 1991. Professor F. K. Salako went beyond the expectations of Scientists (the designation of core Research staff employed at International level in IITA) by analysing and writing up data collected at Okomu for Journal publication, having been so trained at Nsukka. Although, he was going to be discouraged by two prominent scientists in the Resource and Crop Management Division (RCMD) of IITA, who thought he was encroaching on their responsibility, but the divine grace to publish those research papers in reputable international journals came, with the support of Dr. D. S. C. Spencer, Director, RCMD. This made the late Dr. B. T. Kang, a Soil Fertility specialist who became his Supervisor in RCMD, to be interested in having him work independently in the area of Soil Physics at Ibadan after the termination of the Okomu Project in 1991. It was during his eleven (11)-year stint at IITA that Dr. Stefan Hauser offered him logistic and financial support on a German Agency for Technical Cooperation (GTZ) project, to carry out his Ph.D. research between 1992 and 1997, having registered for the part-time study in the Department of Agronomy, University of Ibadan, Nigeria under the supervision of Late Professor Olaolu Babalola. Professor Salako was listed in Marquis Who-is-Who in Science and Engineering, Eighth Edition, 2005-2006 for Outstanding Achievements. He won Grants from the Third World Academy of Sciences (TWAS), and Training and Research in Italian Laboratories (TRIL) of the Abdus Salaam International Centre for Theoretical Physics (ICTP), Italy which enhanced his Research output and he procured state-of-the-art equipment for the Department of Soil Science and Land Management, at various times. He was a Regular Associate of ICTP between 2005 and 2009, where he was also a Resource Person in 2003 for the year’s Edition of College on Soil Physics. His first visit to ICTP was in September, 1993 when he attended the year’s College on Soil Physics. Professor Salako has taken advantage of these ICTP linkages to train a Ph.D. FUNAAB student in an aspect of isotopic hydrology. It was also to his credit as former Director, AMREC, when substantial external funds were obtained for the Centre. He is currently the Southwestern Nigeria Coordinator (2016-2021), African Cassava Agronomy Initiative (ACAI), a Bill and Melinda Gates Foundation-Funded Project of the International Institute for Tropical Agriculture (IITA), Nigeria. Through this project, seven postgraduate students are being trained in FUNAAB and Federal Institute of Technology, Switzerland. 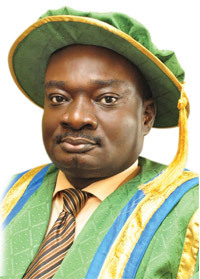 Presently, the FUNAAB component of the project has provided services in agronomy for over 150 farmers in southwestern Nigeria since 2016.His research has led to the development of models and isoerodent maps which can be used to calculate conveniently the potential of rainfall to cause erosion in Nigeria. Soil and Water Conservation Society, Ankeny, Iowa, USA. He has been an Associate Editor of the reputable Journal of Soil and Water Conservation, Iowa, USA since 2009; and Editor, Nigerian Journal of Tillage Research since 2014. He is a Reviewer for many International and Nigeria-based Journals. He has examined undergraduate and postgraduate students in Soil Science for the Award of various Degrees in Ahmadu Bello University, Zaria, Obafemi Awolowo University, Ile-Ife and University of Ibadan, Ibadan, respectively. He has also assessed a number of University Soil Scientists for Professorial ranks in Nigeria and Ghana. Professor Salako has acquired additional trainings on different aspects of his Research and Administrative portfolios through short courses, workshops and seminars in Nigeria and overseas. With all his academic laurels, ladies and gentlemen, Professor Felix Kolawole Salako is a grassroot man and a community leader. He holds the chieftaincy titles of Asoludero of Iwoye Ketu and Bobatolu of Isaga Orile, Ogun State as marks of his contributions to rural community development. He is the current Chairman of Irewole Community Development Association, Osiele, Ogun State. He is also the Chairman, School-Based Management Committee, St. Mary Primary School, Osiele. He is the Chairman of the Apostolic Church Grammar School Old Students’ Association, Ogun State Branch. He is also a Deacon of the Livingspring Chapel, Onikolobo Assembly, Abeokuta. .
Apart from his scientific endeavours, he enjoys reading the bible; history books and documentaries on human societies and corporate institutions. These include biographies, autobiographies of great leaders and intellectuals. He listens to different brands of music. He is married to Deaconess M. O. Salako and they are blessed with children and a grandchild. Please kindly correct the word “workef” in line two.